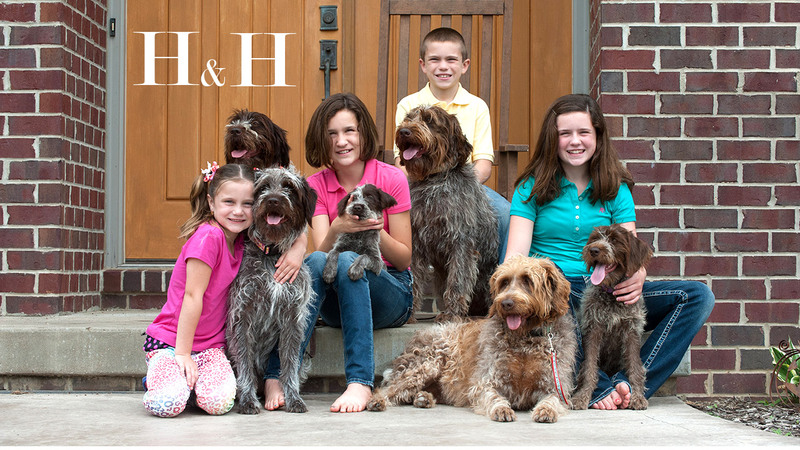 H&H Griffons is family owned and operated. We have been breeding Wirehaired Pointing Griffons since 2008. We absolutely love the entire process of breeding and raising puppies. Our pups have daily contact with our 4 children starting the day they are born. Raising puppies is what I do, I do not work outside of that because I feel I would not be able to give the dogs and puppies that attention and care that they deserve. We live on a 40 acre farm with 2 ponds for the dogs to enjoy and play in. Our dogs go hunting on a regular basis and enjoy every minute of it. We try to run all of our dogs in NAVHDA but sometimes locations and times do not work out. We strive to breed and raise the highest quality dogs possible. We will not breed any dogs that have any health issues. We certify the hips on all of our dogs and most also have their elbows certified as well. We have a great relationship with our vet, Oakdale Veterinary Services, and we cannot speak highly enough of them.